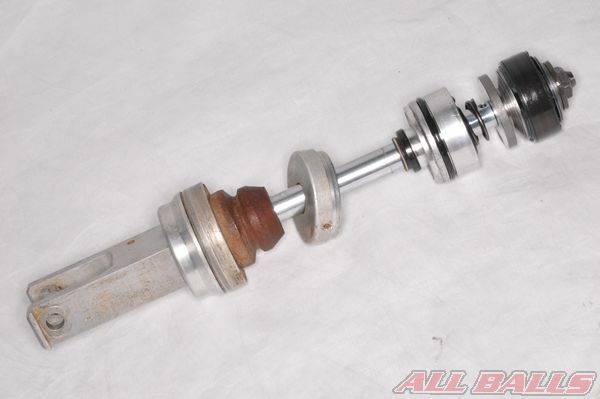 Warning: Rebuilding shock absorbers is not for inexperienced mechanics. Use good judgment when deciding whether or not to rebuild your shock yourself. Note: These instructions are very general and you should have a service manual for your particular model of bike to get a better understanding of your particular make of shock, and have factory recommended torque levels and specifications on hand. 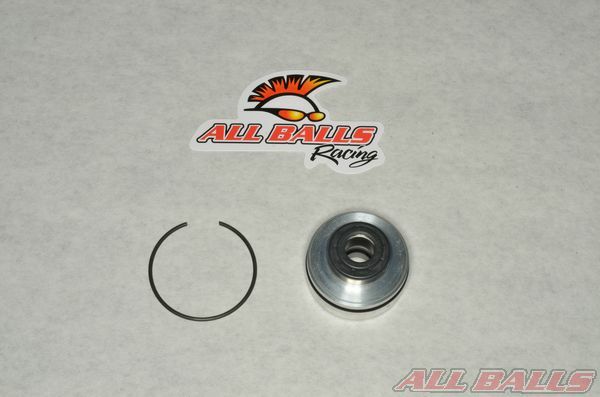 Get your carrier shock seal head kit from ALL BALLS RACING. 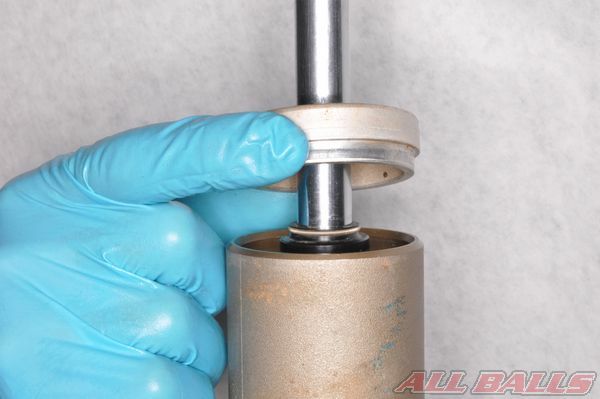 Remove the contents of your ALL BALLS RACING shock seal head kit. Layout the components in an organized manner for easy installation. Note: wait to do this until the old parts are removed and you are ready to begin installing the new components. 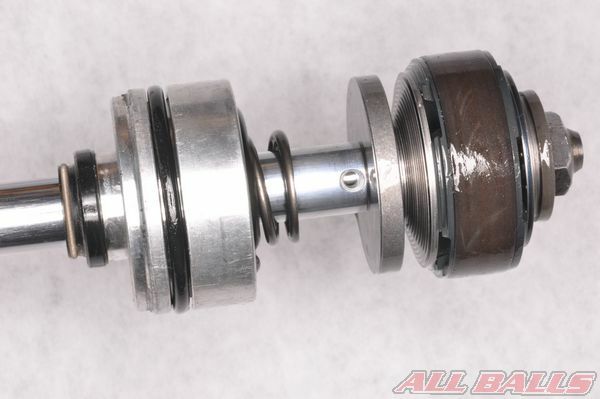 Turn the compression damping and rebound damping adjusters to the full soft position by turning them counterclockwise. Record the number of turns it takes so the adjusters can be returned to their original positions. Measure the spring length so you can return it to its original preload setting. 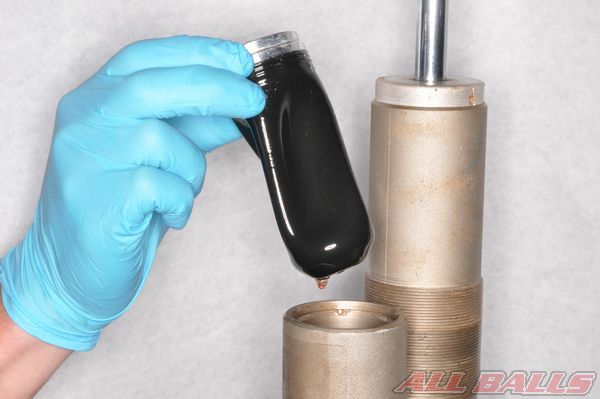 Clean the preload nut threads with contact cleaner. 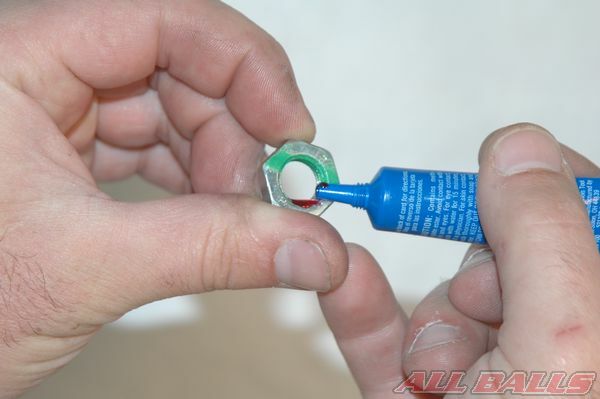 Lubricate the threads to make removing the nuts easier. 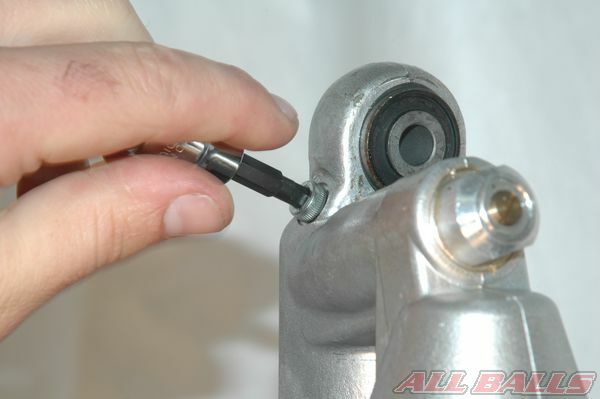 Loosen the lock nut and the adjusting nut with pin spanners until there is no tension on the spring. Move up the spring seat to uncover the stopper ring. Free the stopper ring from its groove. Slide the spring seat off the bottom of the shock absorber. 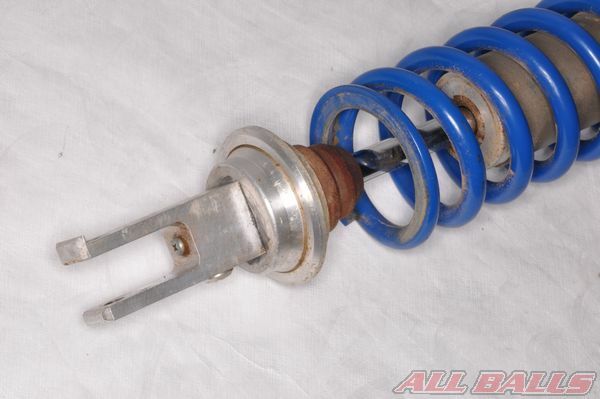 Slide off the shock absorber spring. 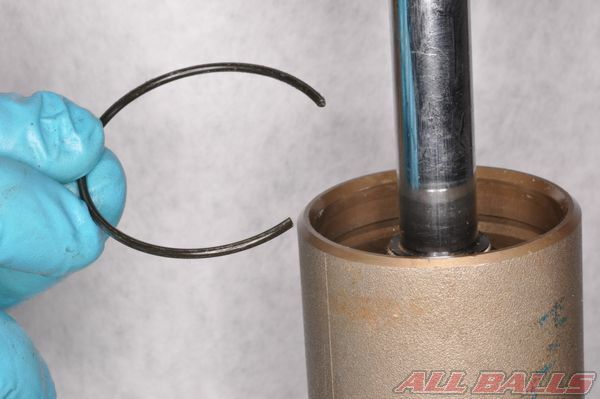 Inspect the shock absorber for damage and oil leaks. Remove the gas valve cap. Vent the nitrogen gas before disassembling the damper. Point the valve away from your eyes when bleeding the gas. 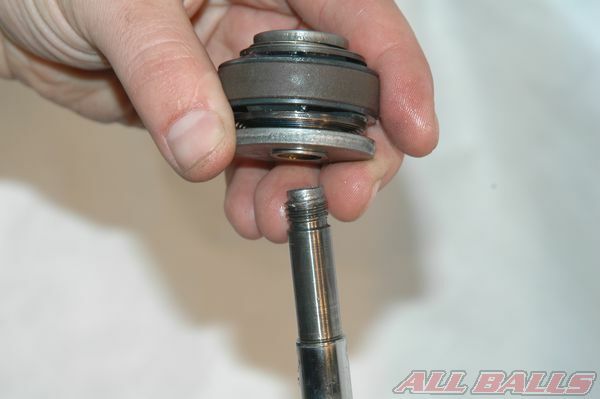 Remove the damping adjuster or oil drain plug. 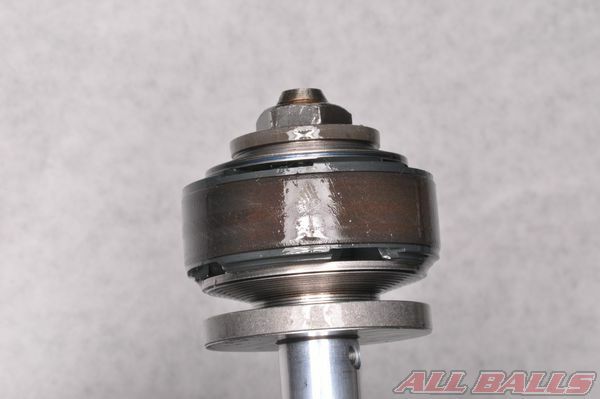 Remove the O-rings from the damping adjuster. 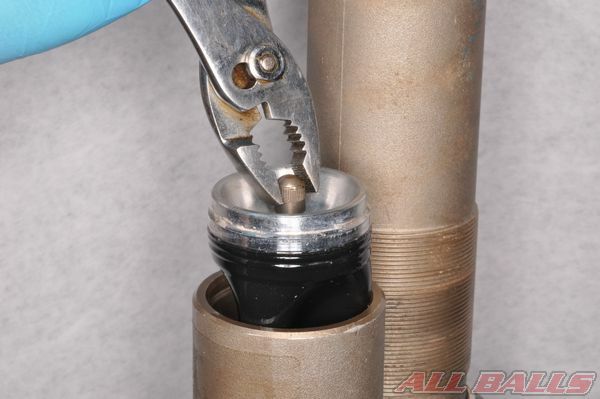 Hold the damping adjuster/oil drain hole over a suitable container and move the shock through its stroke a few times to drain the oil. 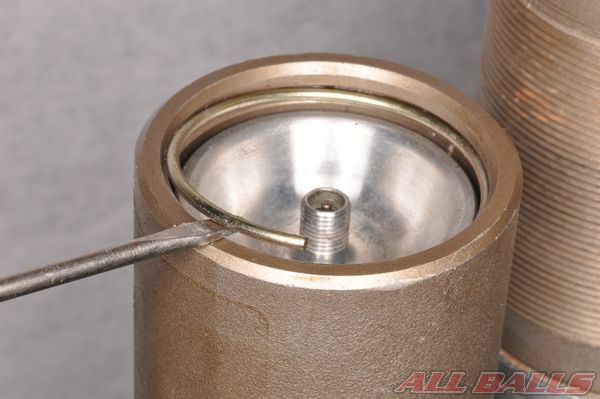 Cover the valve with a suitable sized socket or tool and press down. 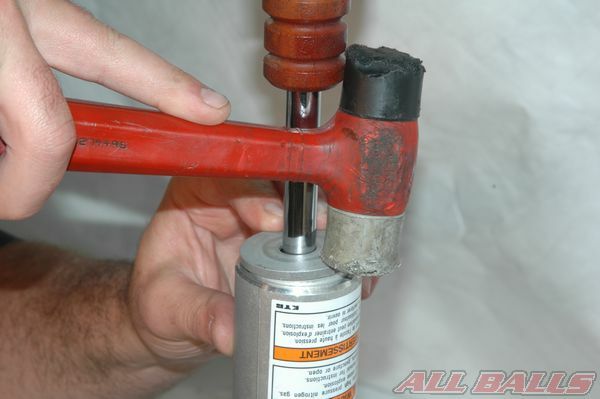 It may be necessary to gently tap on the socket with a plastic hammer to get the reservoir cap to move down. 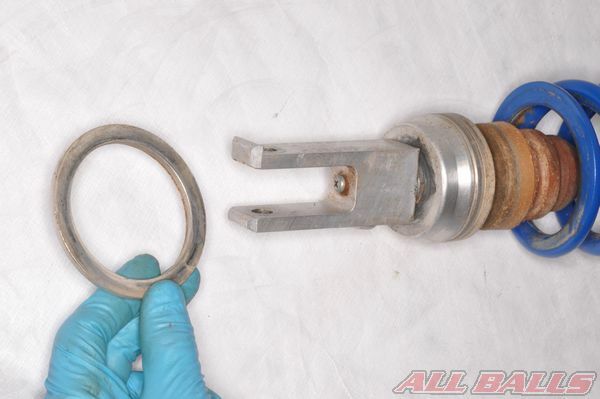 Remove the stop ring with a small pick or screwdriver. Be careful not to damage the walls of the reservoir chamber. Remove the reservoir cap. 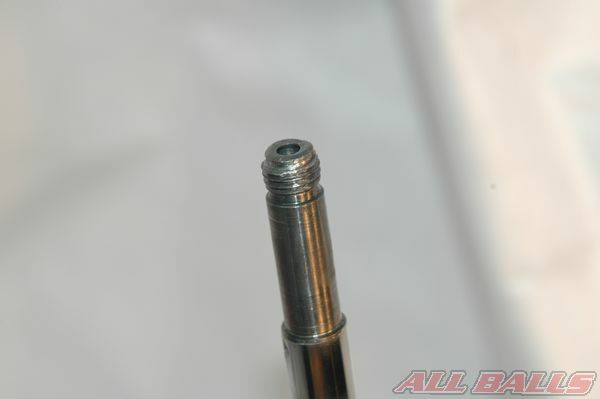 Thread on the valve cover and use pliers or a valve stem puller tool to pull on the valve. Do not grip the threads of the valve directly. 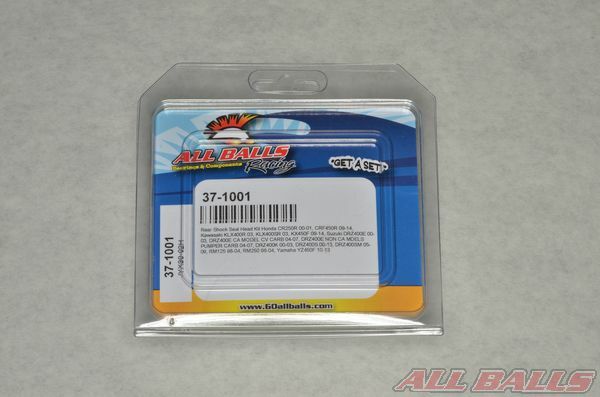 Check the bladder for any cuts, holes or deformation and replace if necessary. There are two holes on the shock end plate. Use a punch to work the sides of the end plate up evenly. Free the end plate from the shock body. Hold the end plate out of the way with a rubber band. Free the stopper ring from its groove with a small pick. Remove the stopper ring. Check the stopper ring grove for burrs, and remove any with a fine emery clothe. Pull out the damper rod assembly. 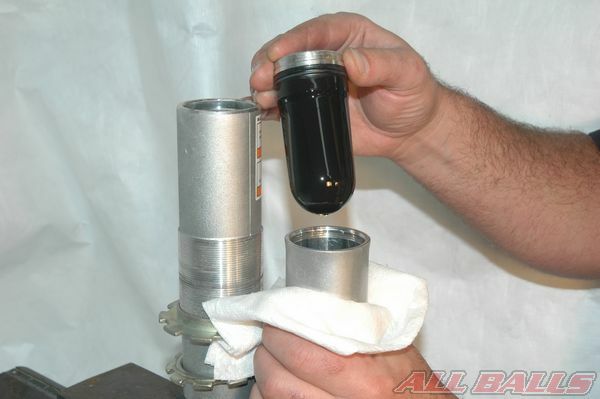 Empty the remaining oil out of the shock body. Inspect the damping components for damage and wear. Replace the parts if necessary. 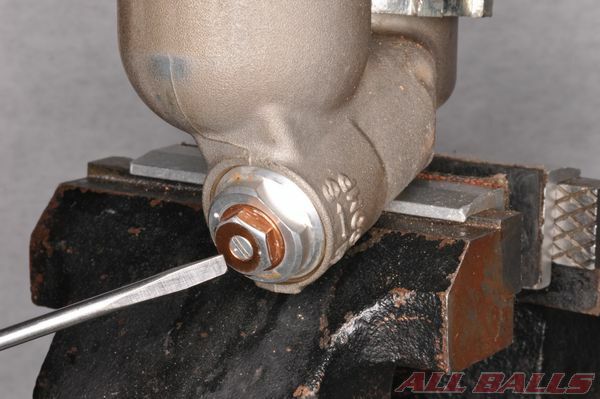 Once the shock is disassembled clamp the lower end of the shock into a vise so the valve nut can be removed. 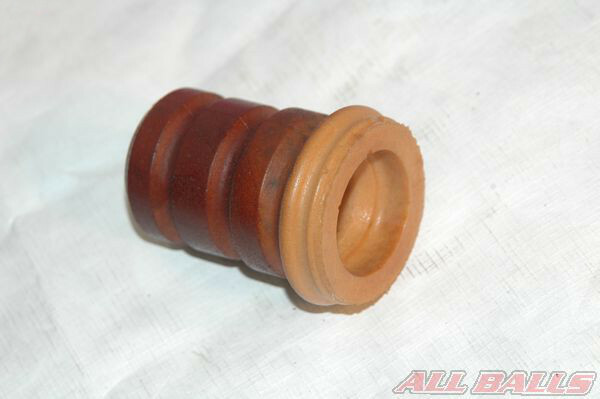 The end of the shock is often peened to secure the nut. If this is the case it will need to be filed in order to remove the nut. 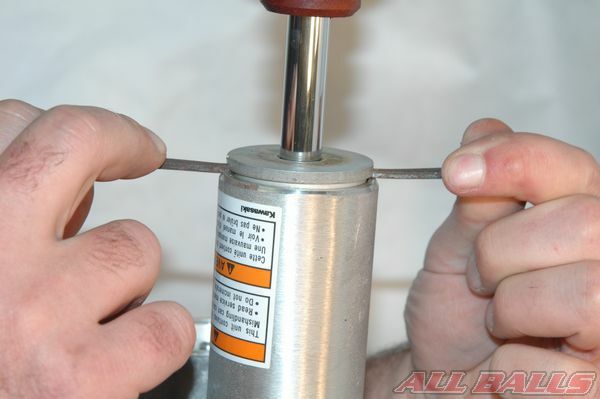 Carefully file the peened end of the rod so the shock shaft does not get damaged. A Dremel tool can also be used. 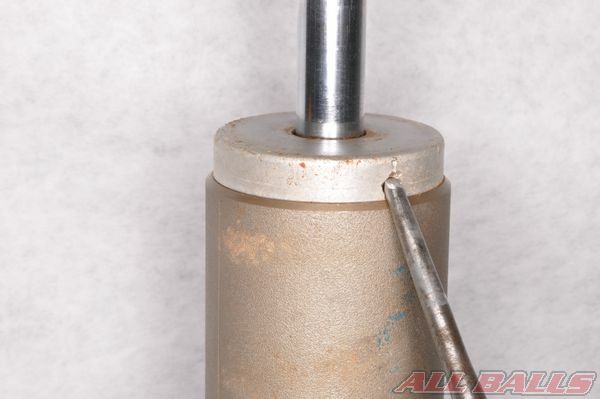 Wrap the damper rod and valve with tape or plastic to keep out the metal filings. Rock the nut back and fourth in 1/4 turn increments until it comes loose. 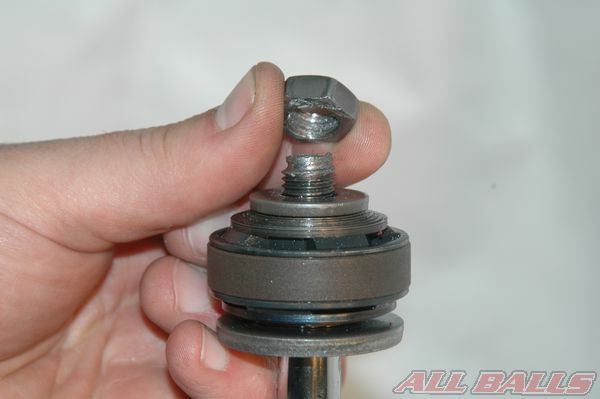 Be careful not to damage the damper rod. 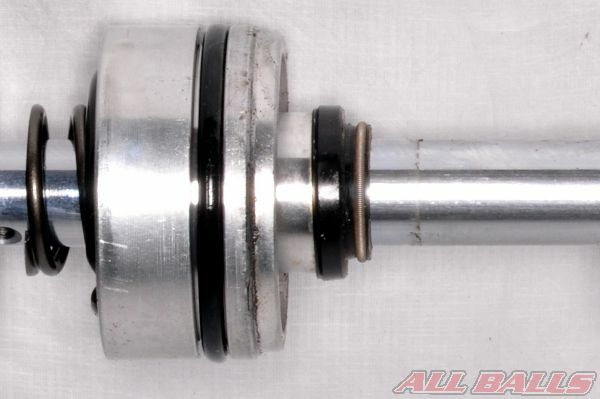 Remove the nut and inspect the threads on the shaft. Remove burrs from the threads, and clean them with solvent. Repair the threads with a die if needed. Remove the valve stack from the shaft paying special attention to where the washers are located. Slide the parts onto a piece of wire to keep them in order. 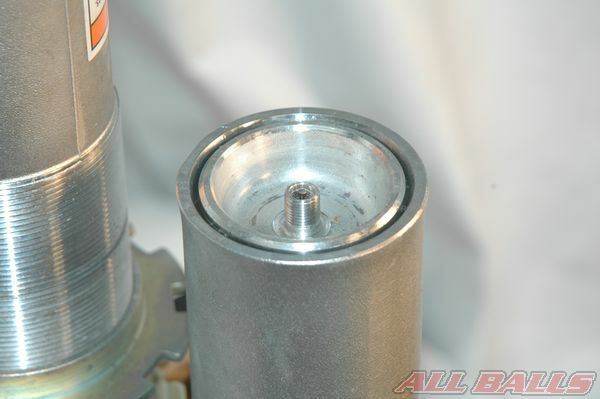 The shock seal head with a rebound spring sits below the damping valve. 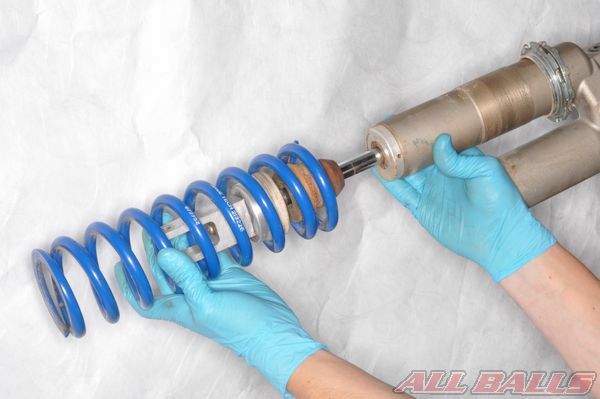 Slide off the shock seal head and rebound spring. 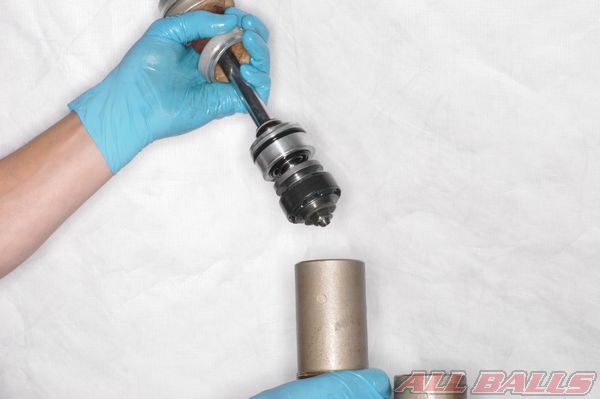 Clean all shock components including the inside of the shock shaft and blow them out with compressed air. Make sure to use a rubber tip air nozzle. Press your finger over the hole on the opposing side of the shaft – this will force any oil or debris up through the top of the shaft. 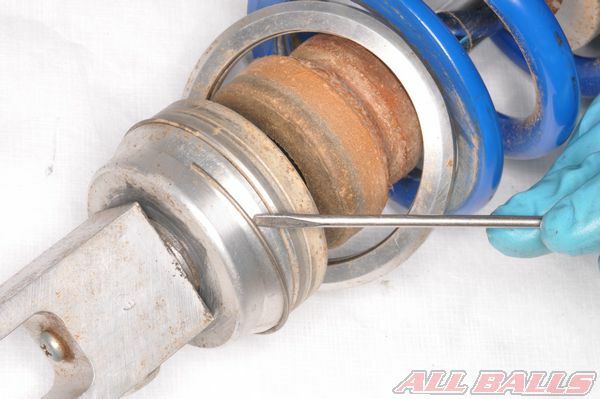 Inspect the shock shaft for nicks rust pitting or scratches. 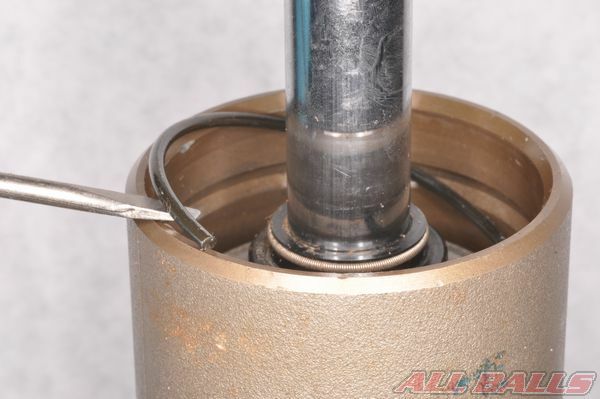 Any imperfections on the shaft could cause seal damage. 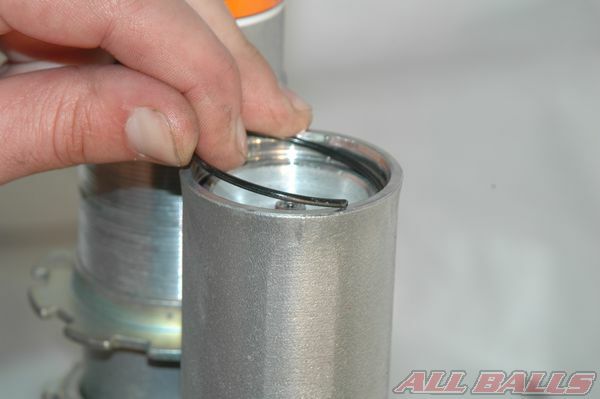 Wrap the valve seat edge in tape to prevent damage to the seal head as it is installed onto the damper rod. Follow any specific oil filling and air bleeding instructions in the particular model’s service manual. Inspect all the shock components making sure they are in good working condition. If the shock bottom-out bumper is cracked, replace it. Replace all of the O-rings with new ones and coat them in shock oil. 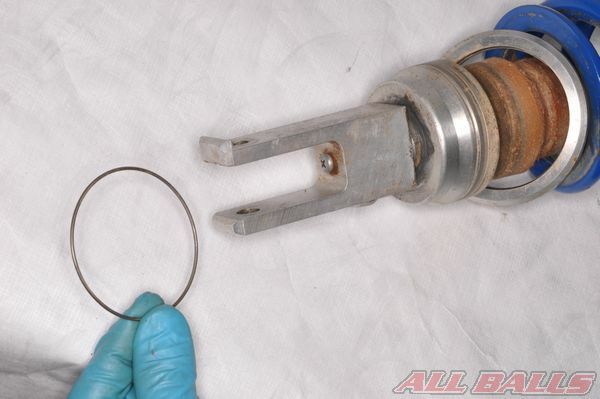 Replace the piston ring if it is damaged and coat it in shock oil. 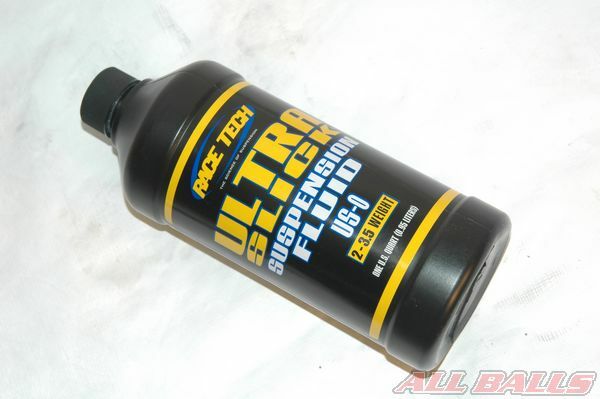 Use an appropriate shock oil for the particular vehicle. 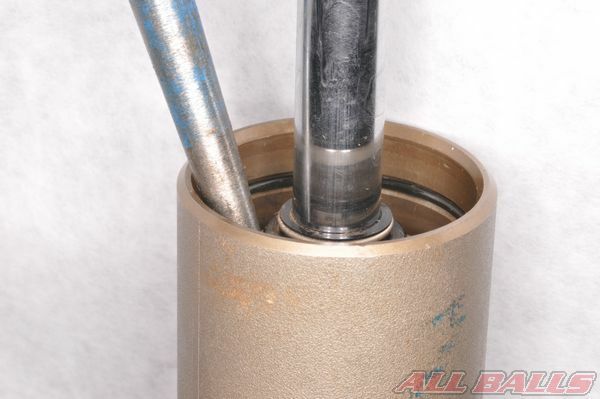 Apply a thin layer of grease to the new seal head and shock shaft. 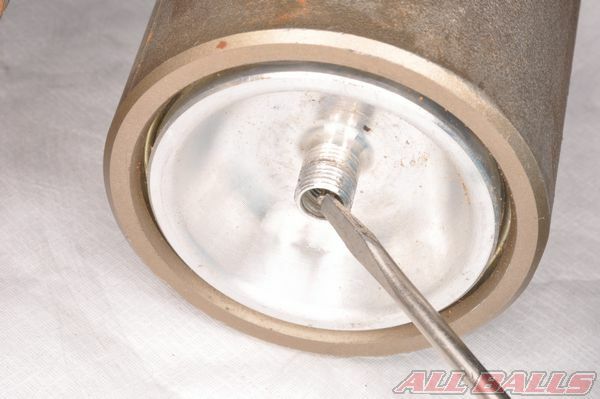 The use of a seal installation tool (seal bullet) is recommended for the installation of the seal onto the shaft. Slide the new seal head onto the shaft making sure that the bottom out bumper and end plate are in place. 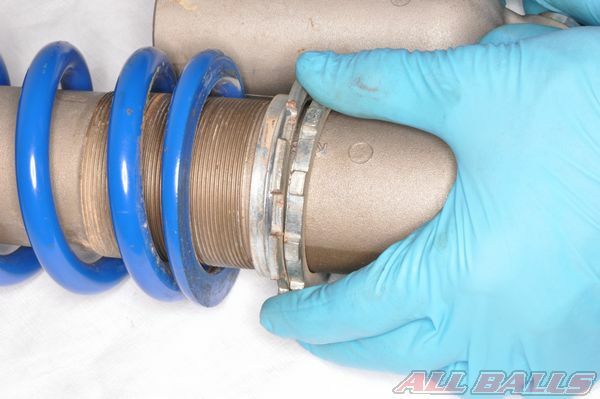 Install the rebound spring and valve components. Make sure to install the valve components to their original positions. The shim stacks must be in the correct order. 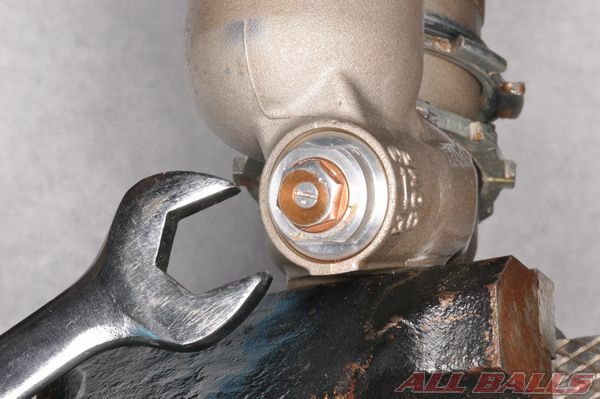 Use a thread locking agent when installing the valve nut, or peen the end of the shaft to secure the nut after if is tightened to specification as required by the service manual. You may need to clean the threads on the end of the shaft with the proper size die. 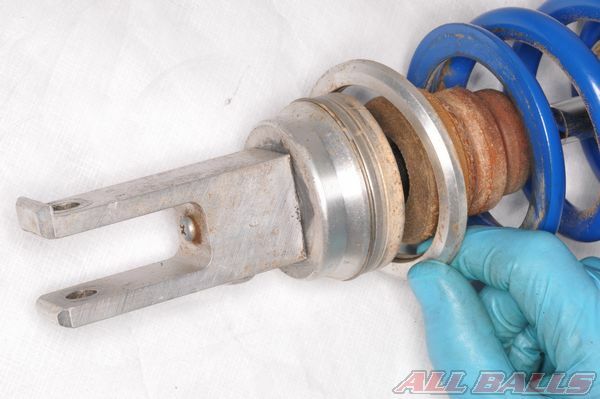 Temporarily install the shock oil filler plug or damping adjuster. Clamp the top of the shock body into a vise. Pour shock oil into the gas reservoir until its half full. Install the bladder in the gas reservoir making sure the bladder is fully extended. OEMs often recommend to use a new bladder. Push the cap down enough to see the stopper ring groove. 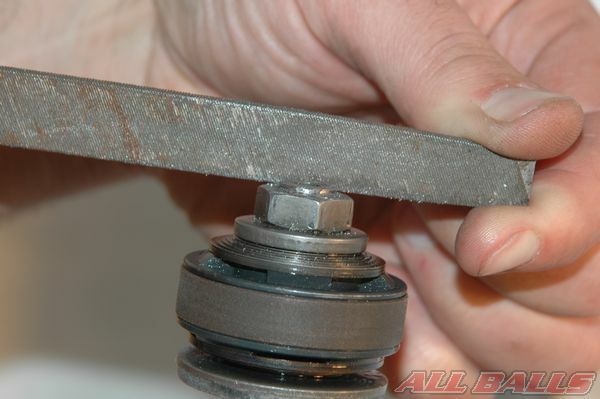 Install the stopper ring and make sure it is secure in the groove. Fill the bladder slowly with air until the cap seats against the stopper ring. Use caution as the cap could fly off it the stopper ring fails. Release the air from the valve. 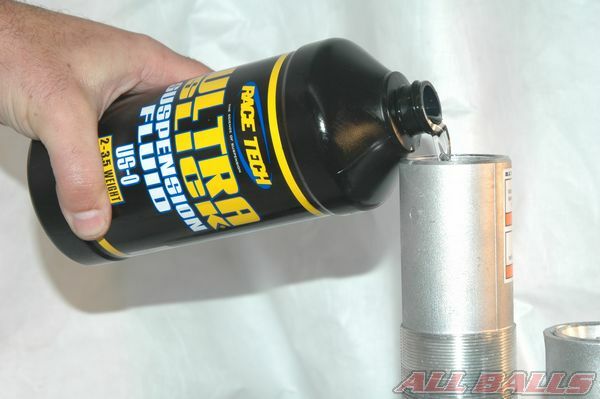 Pour shock oil into the shock body – approximately 3/4 full. 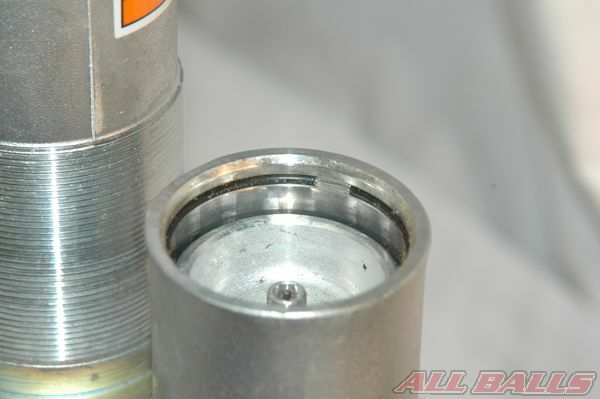 Coat the inside of the damper body, piston ring, seal head O-ring, and damper rod with suspension oil. Insert the damper rod and guide case into the damper body. Work the damper through its stroke to make sure everything is moving smoothly. Install the stop ring into the groove. Make sure the stop ring is secure in the groove. Fit the end plate into the damper body. 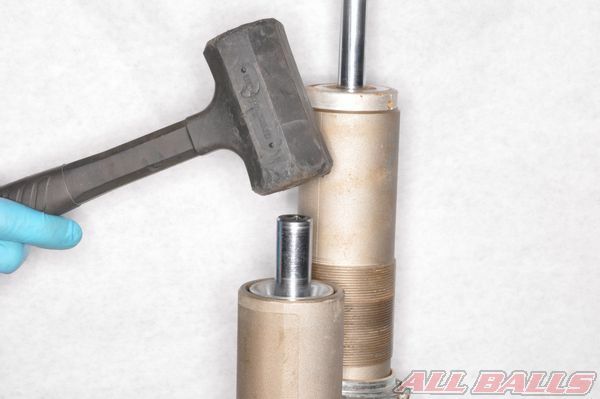 Drive the end plate into the damper body with a plastic hammer. Be sure that it seats evenly. Fully extend the the damper rod. 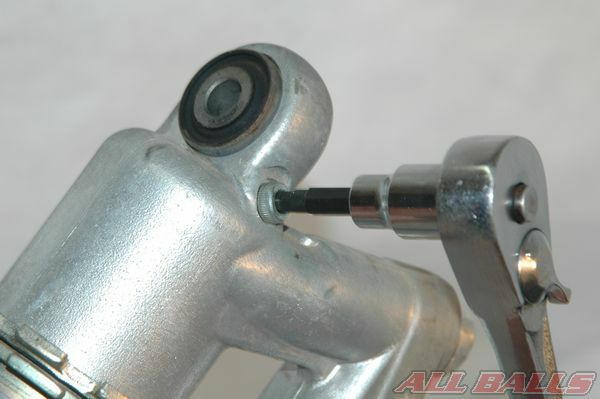 Reposition the shock in the vise so the damping adjuster hole/oil filler hole is pointing up. The shock should be at such an angle that the bottom of the damping adjuster/oil filler hole should be level with the top of the reservoir. 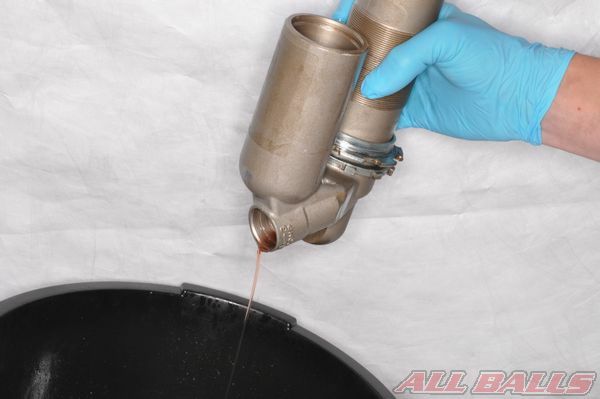 Remove the oil filler plug/ damping adjuster to be able to top off the oil. 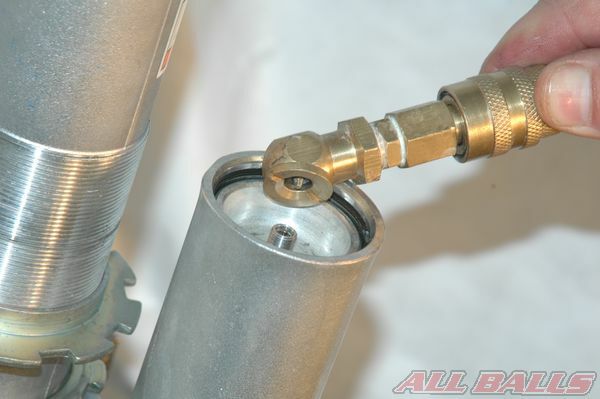 Fill the shock with oil through the damping adjuster/oil filler hole. Pump the rod through its stroke until bubbles stop coming out of the oil. 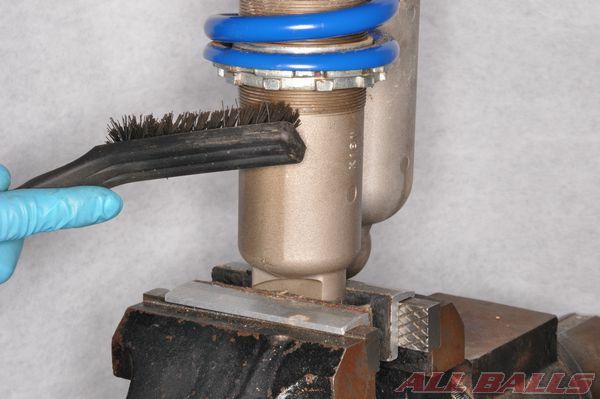 Wipe off any oil that gets on the damping rod. 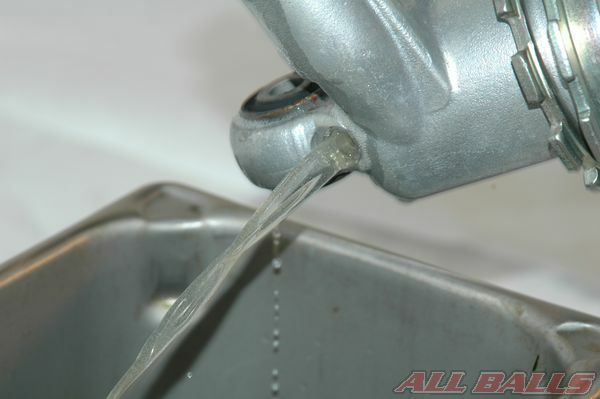 Fill the bladder slowly with air until it reaches 49 kPa or 7.1 psi. 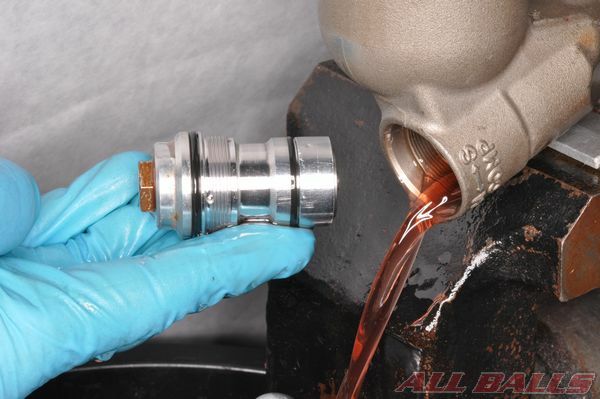 check for any oil leaks. 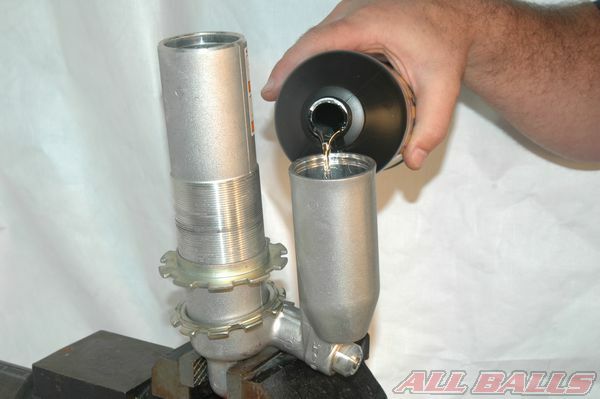 Fill the shock with oil until it reaches the neck of the damping adjuster hole. Install the damping adjuster/oil filler plug. 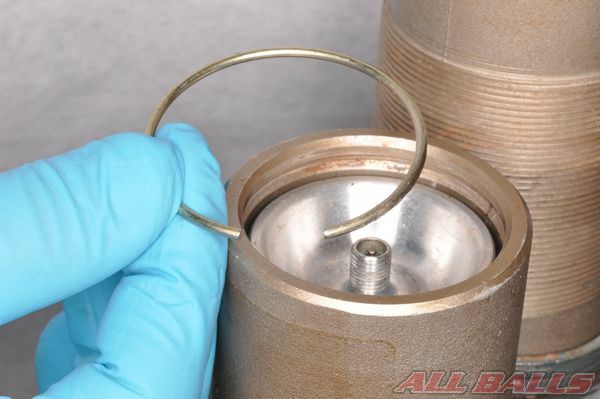 Use new O-rings and/or sealing washer with the filler plug or damping adjuster. 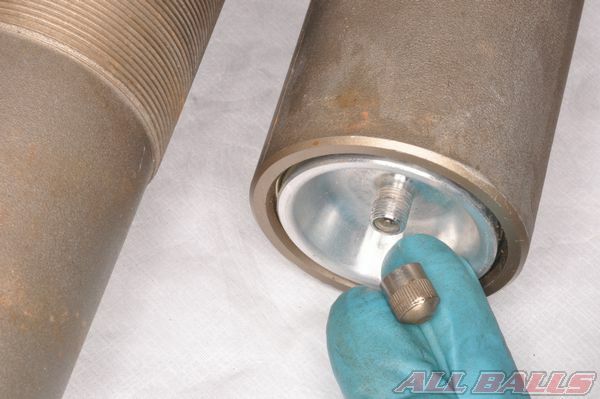 Tighten the filler plug/damping adjuster to specification. Release the air from the valve and refill the bladder with nitrogen to the proper pressure. 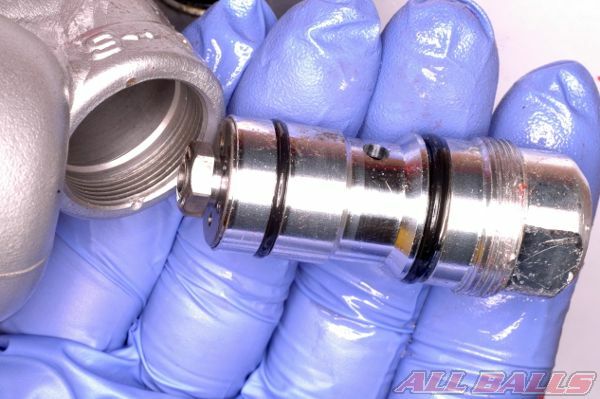 Check for oil leaks and install the valve thread cap. 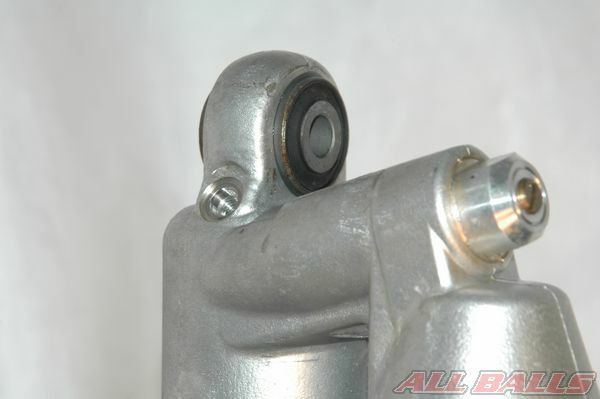 Turn the lower shock mount so that the rebound adjuster is on the same side as the compression adjuster, or as indicated in the service manual. Slide the spring onto the damper rod with the narrow end facing towards the bottom of the shock assembly. Install the spring seat and stopper ring. 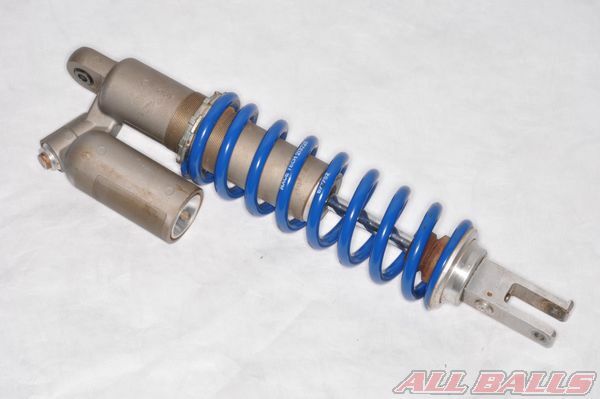 Adjust the spring set length to the correct specification, and return the damping adjusters to the correct settings.